An eastern North Carolina film industry leader, the Wilmington Regional Film Commission has a reputation for excellent crews, equipment, and of course for the effects and possibilities housed in the EUE/Screen Gems Studios. Since the early 1980s, the commission has been offering these resources to both local and out-of-state filmmakers, as well as the area knowledge necessary for choosing the best locations in which to film. Part of this includes educating project leaders on the benefits of bringing their cinematography adventures to the state, which in turn bolsters the local economy and arts scene. When this push for industry activity and awareness pointed towards new promotional materials, the Sage Island crew was happy to lend a hand! 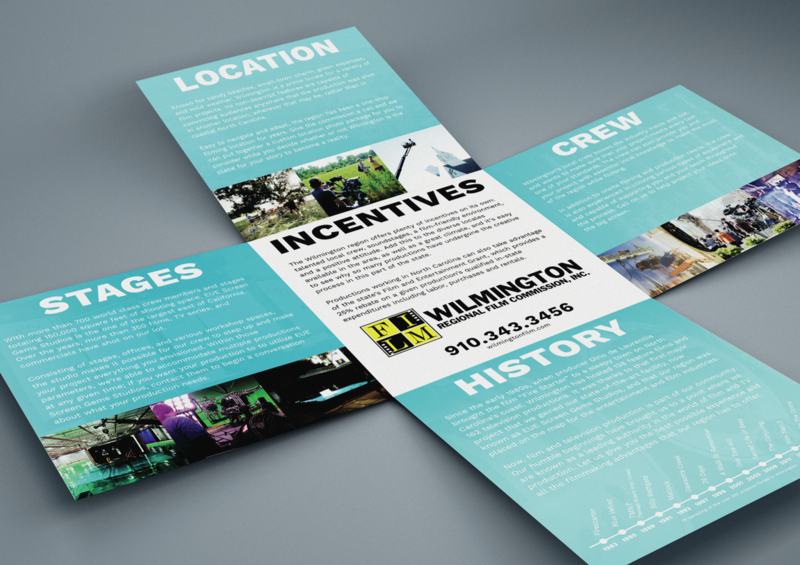 We wanted to help represent the Wilmington Regional Film Commission’s many wonderful assets in the most concise, yet engaging way. So, rather than commit to the typical style of brochures, we opted for the iron cross. What makes the iron cross design so unique is that, instead of rectangular panels, it employs square sections and folds in on itself in that cross-hatching pattern. We adapted our informational copy to fit this design so that as many pertinent details would be represented without overwhelming any potential readers. We also worked with the commission to pick the best possible areas to address, the ones that would be the most useful to others in the industry looking for a reliable nonprofit that could assist in breathing life into a film’s manuscript. These points of interest included the organization’s background, features of the EUE/Screen Gem Studios, and incentives for selecting the state of North Carolina as a filming location. We also carried over some of the design changes we made to the commission’s website to accent the panels of the brochure, including the blue and yellow accents and photography from past projects, of which the commission was pleased to be a part. By making use of a traditional marketing format, the commission has the chance to recapture its local audience as well as expand its reach to incoming filmmakers and producers. We look forward to watching it flourish in the industry economy as it assists with future projects right in our own backyard!